This mimic box is made of wood, stained and sealed. The creature is made of premium leather wrinkled and crinkled in all the right places with hand made eyes. The front closure and hinges are in an antique style. He is a double box with to sections. The bottom section is 6 1/2 inches (165.1mm) across the front x 2 inches (50.8 mm) x 4 inches (101.6 mm) front to back. This section can hold up to approximately 70 dice (7 sets). The top box is 6 1/2 inches (165.1mm) across the front x 4 inches (101.6 mm) x 4 inches (101.6 mm) front to back. The top section can hold cards and your miniature characters! A great size for treasures you collect in any world. All my One Of A Kind original pieces are signed by...me, Pippenwyck!!! I hope you like this creature!! He has many brothers and sisters so come visit often. You never know what you might find...Or what might find YOU!!! 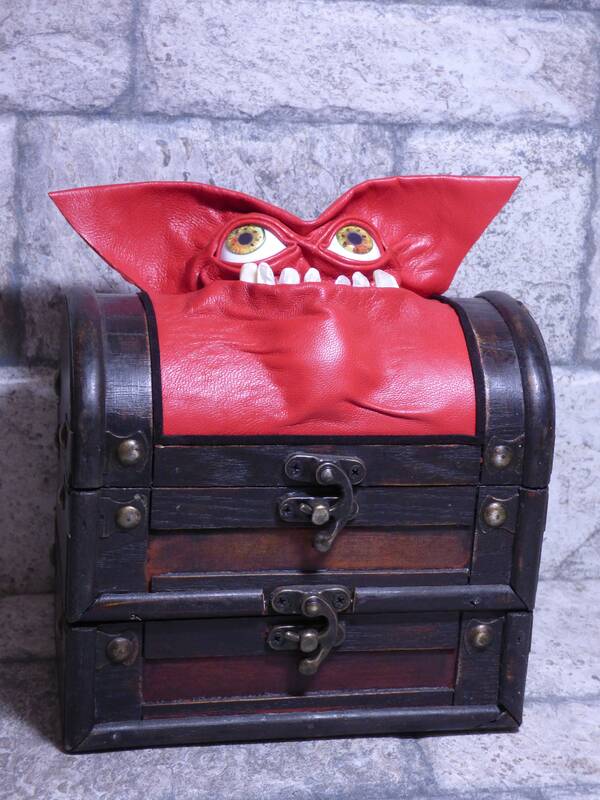 Although he has agreed to provide protection for treasures put within his box(s) he did NOT make any promises regarding mischievous little tricks, deceptions or chicanery!! I would suggest caution and vigilance should this enchanted box come into your possession!! You have been warned!